If you’re looking for a way to improve the value and quality of your home but can only tackle a single project, upgrading the countertops in your kitchen is a great way to go. Regardless of your budget, you can afford to spruce up your kitchen’s counters, making your home more beautiful and valuable. New countertops are an easy upgrade you can tackle either yourself or with a professional’s help – and you have many different options for freshening up your kitchen’s surfaces. 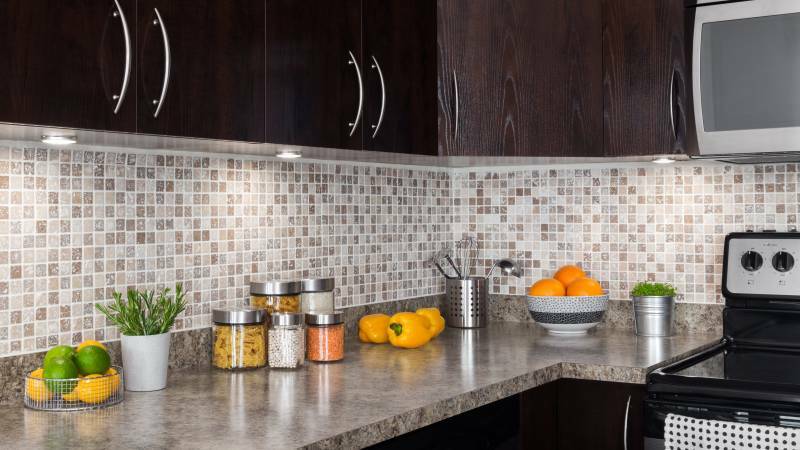 Today’s most popular countertop materials come in wide arrays of styles, sizes, designs, and prices, meaning you can give your home a dramatic facelift without breaking the bank. Here are five of today’s best budget kitchen countertop ideas. Quartz may sound like a precious material, but when you’re talking about countertops, quartz typically refers to engineered stone. This man-made material contains approximately 93 percent quartz materials, which are broken into chunks and then mixed together with resins and coloring. And it’s an incredibly popular choice for homeowners looking for stylish countertops at a low price: just a few years ago, quartz surpassed granite as the most popular material for countertops according to the National Kitchen and Bath Association. One reason homeowners are turning to quartz? It’s tough and durable, meaning quartz is an investment that’ll stand the test of time. Quartz is virtually impervious to stains, including those from acidic foods — and no sealant is required to keep your countertops looking perfect for years to come. Average cost: $40 to $100 per square foot installed. Unlike quartz, granite is pure, natural stone. It offers a completely unique design that’s tough to beat, its appearance formed by weather, the earth, and centuries of time. This material was the most popular countertop choice for many decades, and it’s easy to see why. Granite is cut into large slabs (typically up to 10 feet long) so seams aren’t an issue. It’s available in a variety of colors and incredible patterns, ranging from dark reds and blacks to blues and browns. Because this material is natural stone, however, it must be sealed to prevent common kitchen stains. This sealant must usually be reapplied every 10 to 15 years. Otherwise, it’s very durable, although the corners and edges can be susceptible to chipping. Available in matte or polished designs, granite is a stunning upgrade for any kitchen. Average cost: $75 to $250 or more per square foot installed. Commonly known as Formica, which has long been one of the most popular brand names for the material, plastic laminate is among the most versatile and affordable countertop options. Even if you do a lot of intense work in the kitchen, you can rest assured that this hard-wearing, durable material is up to the task. Laminate is wonderfully resilient, and it’s offered in a dizzying selection of colors, textures, and patterns. Out of all of the materials on this list, laminate is the easiest to install yourself, so it’s a particularly good option for people on tight budgets. Typically sold in sheets that are 2 x 4 feet or 4 x 8 feet in size, laminate can also be cut to fit long counters. Average cost: $15 to $25 per square foot installed. Ceramic tile has largely fallen out of favor since its heyday in the 1970s and 1980s. Still, this kitchen countertop material affords you the ability to create something truly custom and unique without spending a fortune. Some of the perks of using this material are its durability and easy-to-clean nature, and you can safely place hot pans on its surface. Additionally, it’s offered in many textures, designs, and colors. Be forewarned that ceramic tile cracks and chips easily, so it’s not ideal if you tend to be tough on kitchens. The grout between the tiles can easily stain, and the countertop itself is uneven. Average cost: $30 to $50 and up installed. In the past, concrete countertops were usually poured on site. This didn’t always produce the most aesthetically pleasing results, but things have changed. Today, precast concrete countertops are readily available – and more attractive. Thanks to advanced engineering and design processes, these concrete counters look remarkably like slabs of natural stone in many instances, so this is a great alternative for people who like stone but whose budgets don’t allow for it. Precast concrete counter tops are cured and finished at the factory, so they arrive ready to use. Typically about 1.5 inches thick, they are poured and cured in a way that makes them wonderfully smooth and flat. These slabs are usually offered in lengths of up to 10 feet, so they don’t produce unsightly seams. Although concrete is attractive and unique, it does chip and scratch easily. Average cost: $65 to $135 installed. Whatever vision you may have in mind for your kitchen, there’s a countertop material that suits it. Before deciding upon a countertop material, make sure to get some quotes on from local hardware stores and contractors in your area. Search online to compare different price estimates and material costs to determine how much countertops in quartz, granite, or other styles will cost. This will make it easier to zero in on an option that suits your design needs as well as your budget. Regardless of what you choose, you can be sure the finished product will boost the appearance and value of your home. New countertops can breathe new life into any kitchen, improving every day in little ways – and with a professional’s help, you can install quality countertops at an affordable price. Interested in finding kitchen countertop quotes? Start a search today. A messy, unmade bed can actually make your home healthier: research by Kingston University found unmade beds to have cleaner mattresses.